News flash! Or should we say hot flash? New Hampshire’s Portsmouth Brewery has released a craft beer for women experiencing menopausal symptoms. 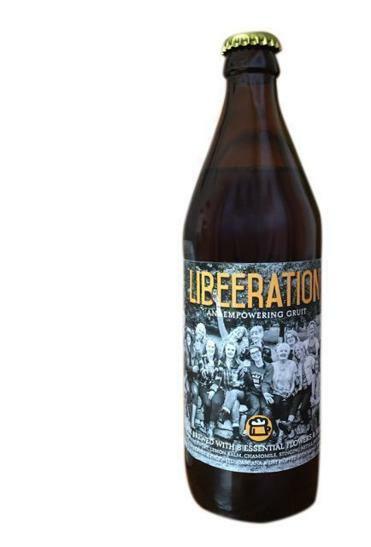 Libeeration is designed to “celebrate the liberating aspects of this stage of life,” according to a release, with ingredients that could potentially alleviate unpleasant midlife symptoms. Libeeration is a gruit-style ale with fruity, spicy notes. It’s made with a mixture of ingredients used by herbalists to soothe hormone shifts: motherwort, lemon balm, chamomile, stinging nettle, mugwort, rose, chickweed, and damiana. She and her team consulted with women’s health practitioners and herbalists while testing recipes. It’s available at the brewery, by the bottle, until supplies run out. Francis says that the launch is a true liberation for her, too, as a woman in the often male-focused world of beer. “Talking about menopause in mixed company? Talk about a party-ending conversation! But you could put five women into a room, strangers, and they’d be sharing their stories,” she says with a laugh. As such, she hopes that the beer appeals to an overlooked population. She was further inspired on trips to the grocery store, where she was greeted by aisles of health foods — none of them alcoholic — designed to address womanly woes. Best of all, the drink has more than 6 percent alcohol. “Have a beer or two, and you’ll definitely feel it,” she says.